This application may be used for the two (2) types of membership listed below. Applicants must apply for, and maintain, the same type of membership as their firm’s broker. 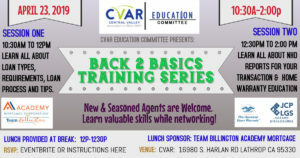 Please call CVAR Office for Fees and payment information. Applications are accepted at the Association office between 8:30 am to 4:00 pm. Find out more about Central Valley Association Benefits below. Central Valley Association of REALTORS® (CVAR) has many partners and works hard to provide value and service to the membership. Besides becoming a REALTOR® when you join Central Valley Association of REALTORS® (CVAR) you also have access and can benefit from the list below. If you have any questions, please give us a call at (209) 858-1700. We are happy to answer any questions regarding your needs! CVAR is actively engaged in protecting real estate issues that impact our business. Local promotion of our REALTOR® members and Master Club Achievers. Subscriptions to NAR and CAR as well as Central Valley Association of REALTORS® newsletters. Central Valley Association of REALTORS®, NAR and CAR research material. A centralized facility for administering member services. Continuing education courses plus courses for professional advancement. Discounted education classes, literature, supplies, forms, books, tapes and real estate updates. Access to meetings and committees to promote individual broker interests. Access to nationwide information network for legislative and legal updates. General meetings and forums where guest speakers and peers can exchange industry ideas. Arbitration facilities where you can avoid costly litigation. Local, national and state legislative advocacy. Tie-in to national and regional promotions that advertise the value of using a REALTOR®. Opportunity to attain advanced professional designations for income enhancement such as Graduate REALTORS® Institute (GRI) and Certified Residential Specialist (CRS). Members subscribe to the Code of Ethics, promoting high standards of conduct in the real estate profession. The Central Valley Association of REALTORS® subscribes to the Affirmative Marketing Agreement and abides by the Code of Equal Opportunity in housing. Application must be signed by your Broker. A copy of your BRE License and picture ID is required. You will be required to complete the NAR Ethics Training within 30 days of submitting your application. Before you submit the application, you are encouraged to review all pages to ensure that you have completed all the information and obtained required signatures. This will assist us in expediting your membership. If you have any questions about the application process and services, please call our office at (209) 858-1700. Once again, thank you. We are pleased to be of service. Click on the appropriate application that you need. You can either fill them out and submit online or print the blank forms and fill them out by hand. Then, just bring back the completed forms in person (with the required signatures) to the CVAR office. If you have any questions, call the CVAR office at (209) 858-1700. New members are taken in between the hours of 8:30 AM and no later than 4:00 PM. Click on Department of Real Estate Forms to access licensing forms on the California Department of Real Estate web site. You can also update your license information and renew your license.